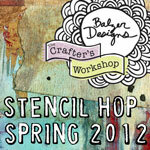 ***Journal Artista***: Balzer Designs Spring Stencil Hop part 2! 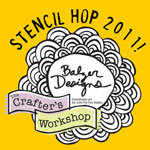 Balzer Designs Spring Stencil Hop part 2! Welcome everyone! So glad you found me here. 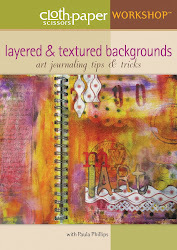 I am so happy to have been able to participate in another blog hop hosted by the wonderful Julie Fei-Fan Balzer. This time we worked with the Wooden Parquet stencil from The Crafter's Workshop. As some of you may know, I am on a mission to change my diet and life. I have been working only in my Weight Loss Journal (or Wellness Journal if you wish) recently and I find it very helpful. When I looked at this stencil, it reminded me of Zebra print. This is one of the many reasons why I love Julie's stencil designs, so versatile! The theme was a Ferris Wheel which is barely visible in the background. I added clear gesso over top of the patterned paper which created a base for the multiple layers of paint on top. 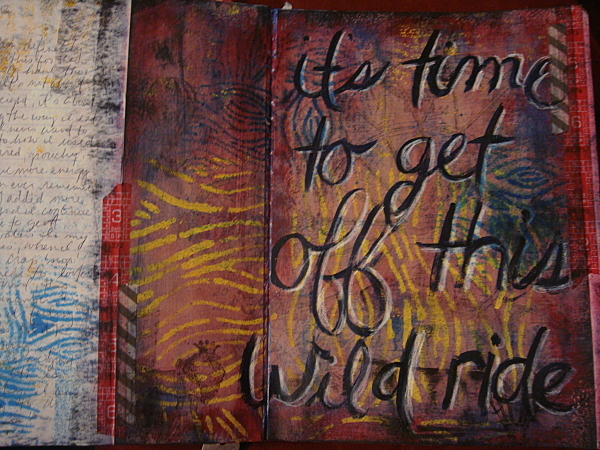 I really like using both sizes of the stencil on the same page. 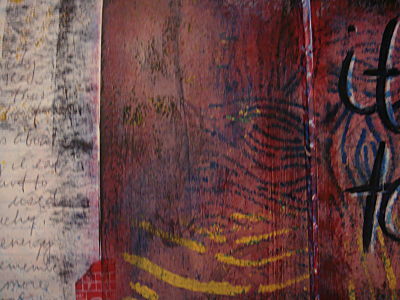 I used the larger stencil as more of a focal point, and the smaller with spray ink as an accent. 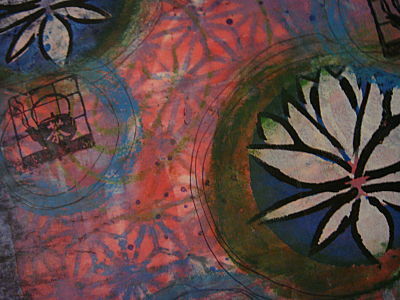 I was not part of the Lotus Flower stencil hop, but check out this page below, I LOVE this stencil too! Join me every Wednesday and Saturday at 9:30pm EST on Ustream, don't forget to Join My Crowd! Also, check out my Youtube channel for over one hundred videos! Please visit the other wonderful participants! Fabulous page, I love that you used both sizes, they look fantastic together on your page! how lovely journal! and the stencil is suits great here! Beautiful page (actually pages, love the lotus one too). I totally didn't think zebra, but I can see it now, and you're right Julie's stencils are so versatile. Thanks! Yet another awesome page Paula. I love all TCW stencils. Wish I had them all. They are so versatile. Beautiful! I love the depth you get in your pages. I remember seeing part of your ustream when you were working on the lotus page, too - nice to see how it looks now! Great journal page! I watched you make it last night on ustream. Thank you for sharing the process. I wish you the best in your endeavor to get healthy. The depth in this spread is awesome! Need to add clear gesso to my shopping list! Great use of the stencils--I see zebra, too! I like the idea of using it as a Zebra print. Both pages are awesome! GREAT use of that stencil Paula! Sorry I missed the stream on Wed. - glad to see you are back streaming - missed you! 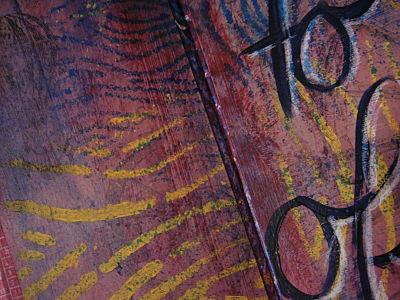 wonderful use of this stencil-and , I happen to LOVE the lotus blossom tooo! 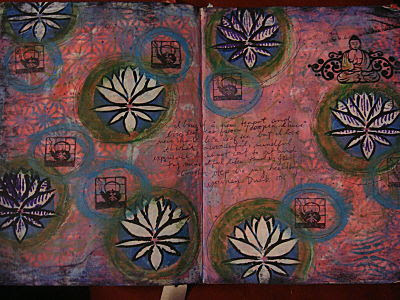 Great page and I love that Lotusblossom stencil template too! Love the page. Great stencils. Thanks for the video. Love your pages and ideas. Have a great weekend. Could I repost a pic of one of your journals in my next blog post- I will definitely include links to your blog and photo credits? Absolutely love this! Beautiful work! posted online fell in May bad credit loans they're functioning needless to say in order to earn profits. Bad Credit Real Estate The application way is basic and fast, and you're going to get accepted to loan after as low as 90 just a few seconds urgent payday loans bad credit you will find additional information about taking your next car loans orrefinance car loanonline at open road lending.